We were delighted to have Deborah from BLG come to read to us today. 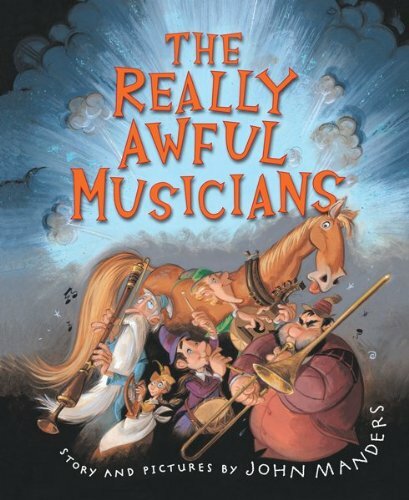 She brought The really Awful Musicians written and illustrated by John Manders. Manders’ book is delightful. On his blog he has jacket art sketches to check out and a link to a fabulous post on the 7 Impossible Things Before Breakfast blog about his book and illustations. The book begins telling us about a kingdom from long ago where the musicians were so terrible that the king ordered that no musicians were allowed to play in the kingdom! If they did, they would be thrown to the crocodiles. “Those royal crocodiles look a little full,” observed Catriona. Mimes replaced the musicians and musicians didn’t dare make a peep in hearing distance of the King or his guards. Drums! Harps! Mandolins! Off Manders’ pages and into our classroom! We soon got worried about the poor horse Charlemagne carrying all of these musicians on his back or pulling them in the carriage. “That horse looks pretty tired!” Not just tired. He was annoyed. “Enough!” he exclaimed listening to the musicians play, “You guys sound terrible! Why don’t you all play together?” He drew 5 lines in the dirt. We were a little confused about what this horse was up to. But then we caught on. “That’s a staph!” “He’s a conductor horse!” Most certainly. Charlemagne coaxed beautiful music out of these musicians. At this time the king came down the road in his coach. Listening to the music, the King urged the musicians to come play at the castle. If they played so wonderfully he wouldn’t dream of throwing them to the crocodiles! The last page shows us the musicians up on stage playing to a captive audience including Charlemagne and some pouting crocodiles. Khai: I liked it because it was funny when the crocodiles got mad because they couldn’t eat the mimes! Raymond: I like the part when the King threw the mime out the window. I like when they played together at the end. Truman: I like the book! The crocodiles were so mad at the end because they couldn’t eat the mimes. It was so wonderful to see the students so animated while Deborah read this book to us. That so many of them are beginning musicians themselves helped us connect and jump right into the story! This entry was posted in BLG Reads this week and tagged BLG Reads, favourite illustrators, fiction, great read alouds, John Manders, picture books, Saint James Music Academy by carriegelson. Bookmark the permalink.